The store brought jams,toppings and preserves have large amounts of sugar and less of fruit flavors compared to the home made stuff.My mother used to prepare all kinds of jams and that varied esp with the seasonal fruits because those are very economical during that particular season and can be used for a long time as jams.We used to love chapathis rolled up in jams as kids.Recently,I got a packet of grapes for a reasonably cheaper rate and so the first thing that striked my mind was to make jam.Jam making is not that difficult task just that you require to keep stirring till you finish.Usually,grapes are boiled and mashed to make jam but here I have simplified this step by simply pureeing the grapes.Do try this method and enjoy your home made jams !!! -Wash and stem the grapes.Put it in a blender without adding water.Blend it 3-4 minutes,strain the juice and add the remaining coarsely ground skin and blend again till smooth or atleast 3/4th done. -Add the sugar and mix again.Then,add the lemon juice or citric acid ,keep stirring. (TESTING)-Add a tsp of jam in a plate,chill about a minute and tilt the plate.The jam if ready will not be runny. -Put off flame and let it cool completely. -Spoon in bottles and use for bread !! * You can add sugar as per the sweetness of grapes and also as per one's sweet tooth. * You can also add water about 3/4 th cup to increase the quantity but I haven't used that. Grape jam looks delicious Julie. Have always wanted to try homemade jam.. This looks easy to make and delicious. Recipe bookmarked..
Nice..never made jam at home! Jam looks delicious.I am a big fan of homemade pineapple jam. me too use this method to prepare jam. 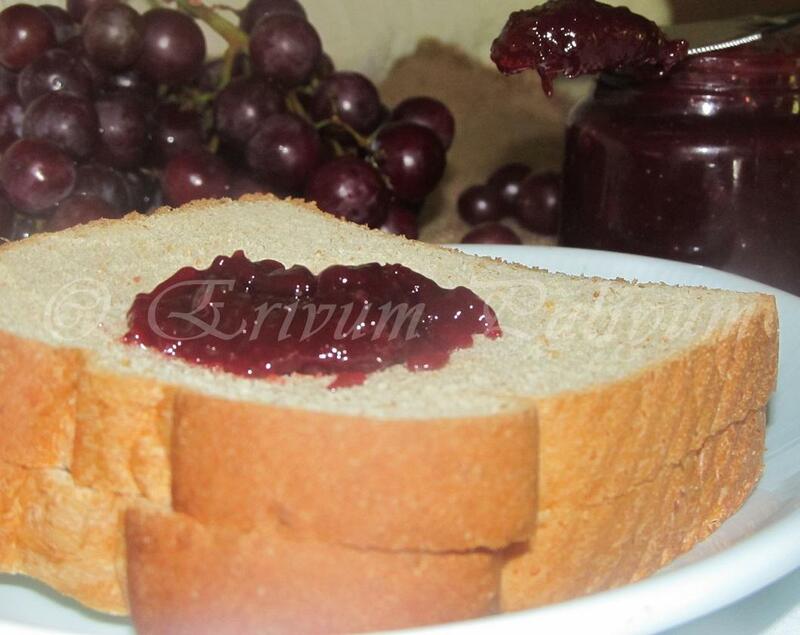 Simply mouthwatering and tempting jam. What you say is true, lots of sugar in the store bought one. Thanks for sharing. will try this. Nothing can't beat these home made ones for sure..Delicious ! Noting like a healthy homemade jam! Loved this homemade delicious and fresh jam..nice colour.. Perfect looking jam, looks really wonderful! Super delicious and glossy jam,loving it. Yummy! Love the look, must be delish! 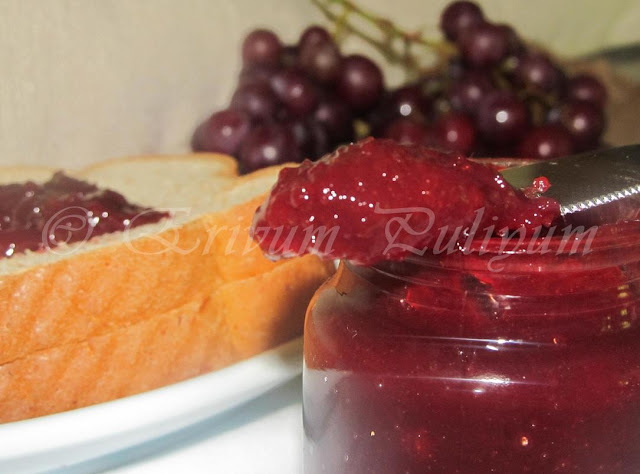 this jam looks amazing julie.i've been wanting to try a jam and this one's perfect and easy to try! Reminds me of Kissan jam.I used to it. Hey I love your method. Must try it this grape season. 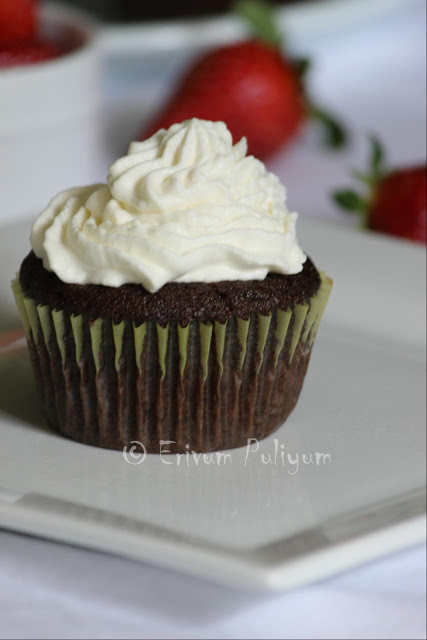 What an easy and delicious recipe Julie! Julie! Catching up with your blog after a long time! 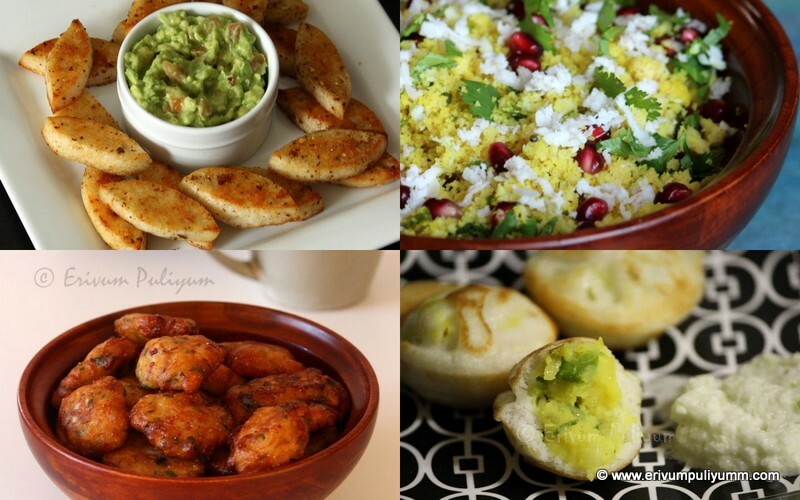 Love the new recipes you've shared! :) This jam is fantastic! You are SO right. Jams and jelly made at home always tastes heavenly and full of flavour. Your jam looks yumme. Would love to spread it on my toasts..yum.. I am not big fan of jam, but my husband loves it and I think he would adore this one! Yummy jam n nice presentation. Looks so good and beautiful color.. 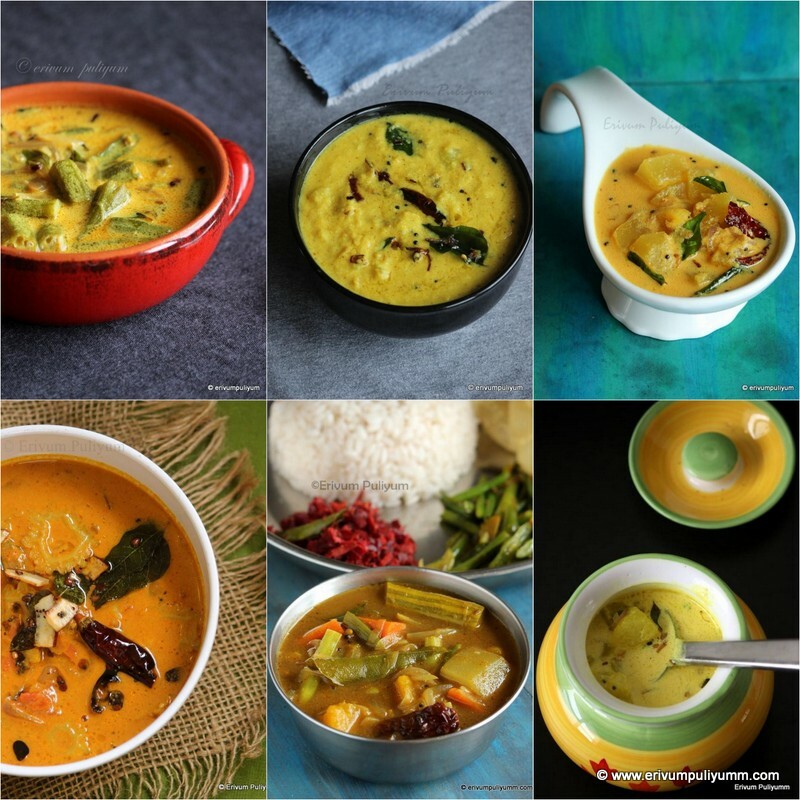 Loved the bright colour & it looks very tasty too !! 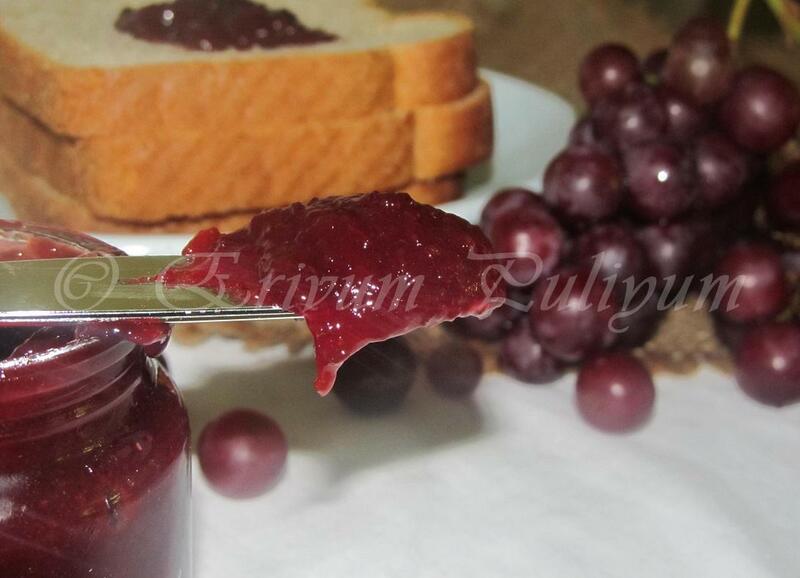 Tempting and yummy jam..nice colour..